However, I'm skeptical of that claim since US has a fairly high top rate of 35% (IIRC) and I have a feeling that the claim I outlined above is mistakenly projected from personal income tax rates. Could someone please indicate if I'm correct in my skepticism of the claim above? 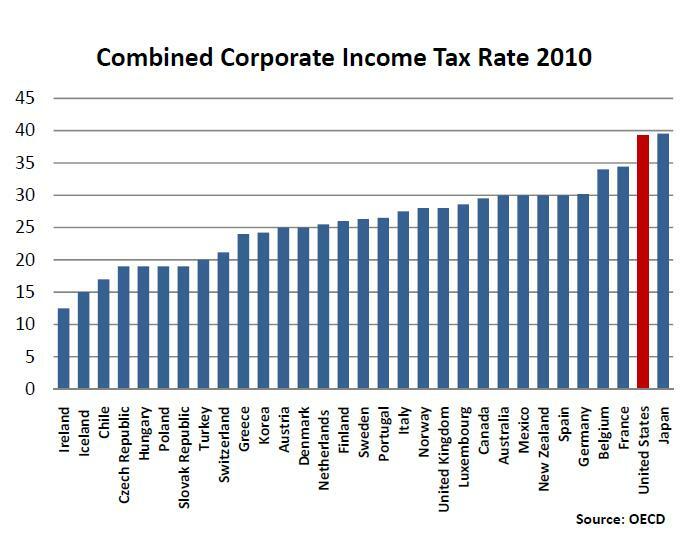 You are correct in your skepticism: USA has one of the highest top corporate tax rates, as well as taxes as percentage of income. 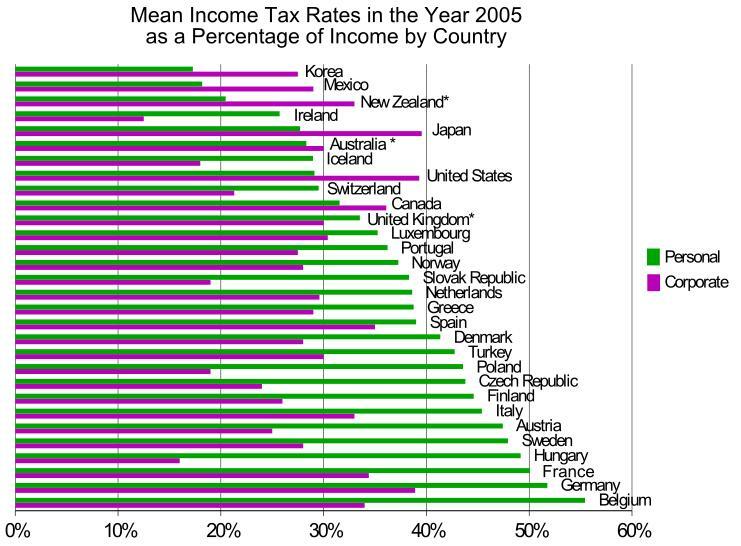 Income Tax rates by Country based on OECD 2005 data. As you can see - USA's is higher than ALL save Japan and Germany which are about the same). Purple bars denote corporate (and you can see the green bars for personal income taxes that show USA's relatively low ones, which is as you noted a possible source of confusion). 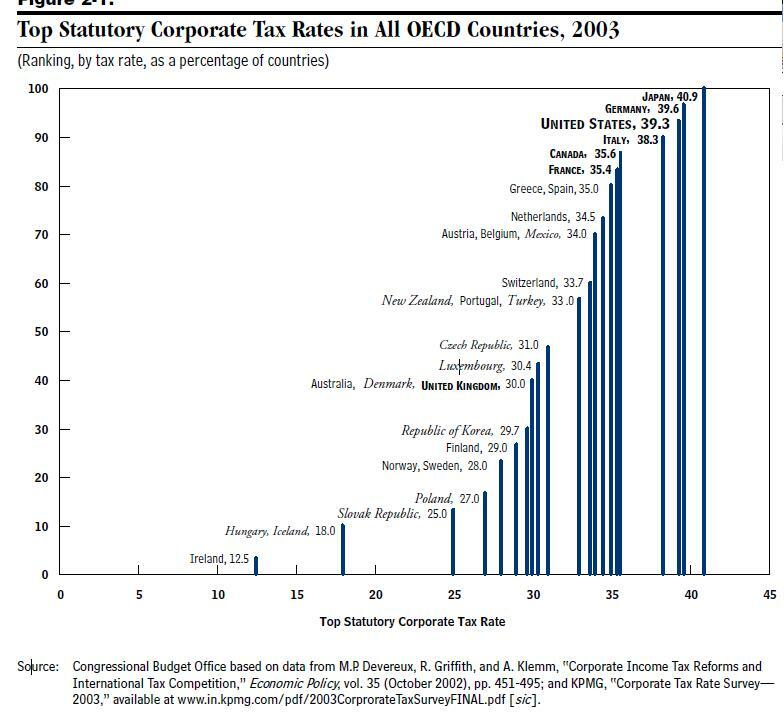 Please see the graph in Figure 2-1 (page 36) of Congressional Budget office's "Corporate Income Tax Rates: International Comparisons". That graph is based 2003 OECD data as well. Please note that CBO is (theoretically) bipartisan/apolitical branch of congress. For example Google uses double Irish with Dutch sandwich, effectively paying as low as 2.4%, Facebook also uses double Irish with Dutch sandwich. So are companies like Apple, Microsoft, IBM and Oracle and many others. While question ask explicitly for "standard tax rates" w/o gimmicks and loopholes, above schema has became standard (as in most commonly used). Some very famous US companies are famous for paying little tax. GE, Google and twitter are good example (see this summary on slashdot). Also, online sales company like Amazon avoid paying taxes to a very significant degree. So, there are some very famous examples in tech world of US companies not paying taxes. I don't know about Europe, but they might have stricter laws there (There was recently news about some similar proposals in the US). Not the answer you're looking for? Browse other questions tagged politics taxes .